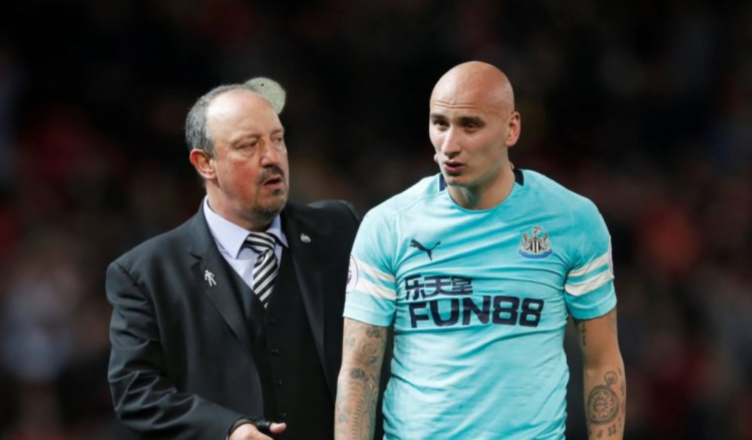 Jonjo Shelvey admits he ignored Rafa Benitez’s advice – & it’s now backfired.. – NUFC blog – Newcastle United blog – NUFC Fixtures, News and Forum. Jonjo Shelvey admits that he played through the pain barrier earlier this season and ignored Rafa’s advice to rest and recover following a recent injury – a decision that’s backfired after missing that last 6 weeks. Shelvey has struggled with fitness all season by his own admission but there is little doubt that when is he is fit and on form, he is a real asset to this Newcastle side. His partnership with Mo Diame was integral to our top ten finish last season and our fine form at the back end of last campaign. “Even on a match day, you miss that buzz of putting the kit on and playing for your club. 🎥 Jonjo Shelvey spoke to NUFC TV this afternoon about his recovery from a thigh injury – and why he still feels he has a huge part to play for the Magpies between now and the end of the @premierleague season. There are some good words from Shelvey there, fans always admire players who are just desperate to play and help the team. Shelvey’s passion has often got him in trouble on the field too, with some red cards and bans during his time at the club since signing from Swansea City. He does though now have a job on his hands to get back into the team on two fronts. His initial replacement was Ki, who was excellent and instrumental in our form picking up after a dreadful start to the season. Then with Ki injured and on international duty, local lad Sean Longstaff has more than seized his chance – serving up outstanding performances in his five appearances so far. Even Isaac Hayden has played really well, even scoring at Wolves on Monday night, and with Diame returning to fitness too all of a sudden we have a load of options in the middle of the field. Knowing Rafa, Hayden and Longstaff will keep their places as they deserve it based on form, so it may need some impressive cameos from the bench for Shelvey to get back into the XI and kick start his own season.